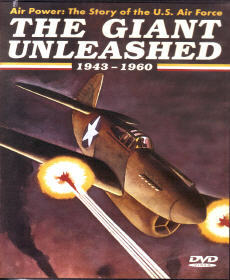 The Giant Unleashed DVD, Air Power: The Story of the U.S. Air Force – 1943-1960 - This DVD traces the development of the United States Air Force (USAF) in the 20th century. From uncer-tain beginnings as the Army Air Force in 1907, the USAF has grown to become the greatest instrument for projecting military power ever devised. In this DVD, we trace the role of the U.S. air power during the last three years of World War II, its emergence as a global air power in 1946, its role during the Cold War and Korean War, and the organization of NATO.